sa, kissing the spots where Jesus was born and where he died, and praying at the Wailing Wall. the support of the global community led by Fr Laurence, Peter’s leadership and guidance and the many contributions from all our dedicated members, we have indeed crafted a contemplative identity for ourselves. At the gathering we reminiscence the past 30 years with a power point presentation of the activities of the 30 over groups that we have in Singapore. Fr Laurence also gave each attendee a copy of his book “ Good Work” to commemorate all the good works done by the community. The gathering ended with a presentation of Bonnevaux, our global community future home. WCCM Singapore has plenty to be grateful for and we look forward to the many opportunities available for us to be of service to the church and the larger human society we are part of. Laurence Freeman spoke on the theme “Sources of Wisdom” in a day workshop in Edinburgh. The event organized by the Edinburgh International Centre for Spirituality and Peace took place at the George Young Hall, LifeCare Edinburgh on 9th February. has become almost a cultural and diagnostic cliché. Every experience of anguish, terror, grief, loss of vitality and purpose is unique and needs to be attended to as such. Every era and every culture has its different ways of describing and responding to these experiences. I wanted to honour the richness and the healing potential within that insight. What did the process of writing this book teach you, or change in you? Jim: It reminded me that there are no easy solutions; that meditation is not a ‘cure’ for what we call depression; that there is much unavoidable pain that we must face and go through in this life. But I also had my faith strengthened that the practice of meditation (and the friendship of meditators) can sustain us as we patiently learn to heal. It can help us to respond with our whole being to Goethe’s wonderfully challenging words: And so long as you haven’t experienced This: to die and so to grow, You are only a troubled guest on the dark earth. Giving Up Without Giving Up Meditation and Depressions By Jim Green More information and order online: http://tiny.cc/GvUpJG “If it is true that all human griefs have their roots in our inability to sit quietly in our own company for five minutes, this spare, candid and calm introduction to meditative practice will be a life-saving gift for many living in or on the edge of the darkness that regularly overtakes us in this uncontrollable world.” – Dr Rowan Williams, former Archbishop of Canterbury. Thanks to the generosity of our global community, Bonnevaux is already a reality, with the opening of the Abbaye at Easter and of the Conference Centre in July. Our main emphasis now is the Guesthouse due for completion at the end of the year. Please visit the Bonnevaux website to see how you can contribute. The small oblate Community that was living at the Meditatio House in London moved to Bonnevaux. This included Fr Laurence - our director is now officially a Bonnevaux resident! from suffering. But something was still missing. Buddhist philosophy was very rich, but there was no such thing as Christ, and the spiritual vision was a little far from what I believed. Then I found Christian Meditation and from that began one of the richest periods of my spiritual journey. I can say that until then I had a conceptual vision of God, through what I had learned from books, catechesis and other forms of knowledge. As I learned from Fr Laurence, I was prepared to answer the first question Jesus asks his disciples, “Who do people say that I am?” But I was not prepared to answer the second question: “And who do you say that I am? “ However, through Christian meditation, I have approached the experience of God, and it is only through experience that we can at least try to answer that second question. The conceptual sense of God has been replaced by communion with God. 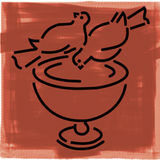 Communion and unity with God lead us to see life differently and to live out of our essence. The present moment is flooded with meaning and we transcend our ego to move toward the other. Thus, I came to live the original meaning of the word religion (Religare) linked to our reconnection with God and our essence. I was able to transcend a dogmatic view of an ingrained system of beliefs. Once, they asked Carl Jung if he believed in God and he replied, “No, I know God.” Believing depends on belief, knowing depends on experience. On the one hand, we have Karl Marx saying that religion is the opium of the people and Freud classifying it as a neurosis. On the other hand, we have John Main and Laurence Freeman, saying that religion leads us to a new unity and to what we are called to be. We have the Dalai Lama saying that the true religion is one that makes us a better person. And Rumi, an Islamic mystic who says: My religion is to be alive in love. Everyone may be correct, depending on how we relate to religion. Only experience can help us understand these interpretations. Christian meditation brought a huge gift to me: the experience of God. And when we are touched by this experience, the feeling of being at home comes along and all other searches become secondary. 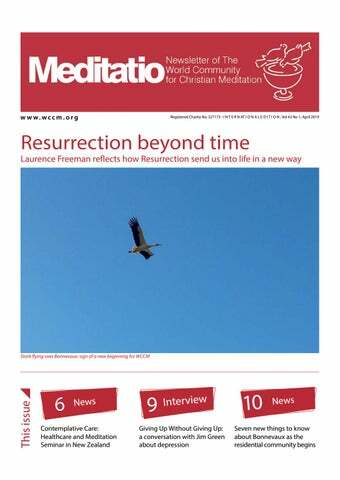 Editor: Leonardo Corrêa (leonardo@wccm.org) Graphic Design: Gerson Laureano Would you like to contribute to the Meditatio Newsletter? Our next deadline is 10 June.